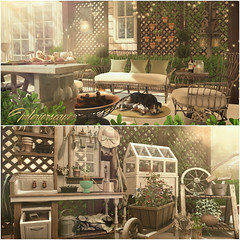 I am super pleased to feature these gorgeous entryway items from Di’Cor. The set can be purchased in either dark or white tones and the designer generously gives you texture change options in the ottoman as well as a few different choices for art style. A huge bonus if you’re constantly changing your surroundings like me! You can easily use any of the items in multiple ways when creating your space so go crazy! This particular set includes the console table, art, candelabras, ottoman, pillow basket & readers pile. You will find the purchase info below as well as information on where you can find other items used in this scene! Di’cor – Susan Entryway Set. This set comes in two different color styles and is currently available at the On9 event until the 28th of Aug.